Chris discovered yoga last century whilst working on assignment in Mexico City. He enjoyed the openness and physical wellbeing that yoga classes gave him and found it to be a wonderful way to balance the pressures of his then international financial career. 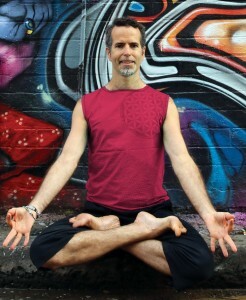 Chris has taught beginners through to advanced practitioners in Sydney since 2007. He has also taught workshops in Berlin, Vienna & Mexico and at various locations & festivals in Australia. He regularly trains with many world-renowned teachers. He would like to acknowledge his teachers David Life, Sharon Gannon and Anja Kühnel for sharing the Jivamukti Method with him and for guiding him on his path to his 800+hr Jivamukti Advanced Certification. He has also studied various anatomy and physiology courses to improve his understanding of human movement including the application of bandhas to create a strong safe yoga practice, and applies this in every class. He would like to acknowledge his long time yoga teacher Simon Borg Oliver (Aus) for sharing his deep yogic, physiotherapeutic and physiological knowledge. Chris is also certified in Nuad-Bo-Rarn (Thai Yoga Massage), and is available for private yoga, corporate yoga and Thai Yoga Massage sessions. He would like to thank all yogis – students and teachers alike – who constantly inspire him to dive deeper into the teachings of yoga.